Soldier of the KNLA (Karen national liberation Army) on the back of a Pickup truck. For more than 60 years, they have resisted against the Burmese military forces. It is the longest ongoing civil war in the world. A soldier of the KNLA (Karen national liberation Army) guerrilla unit patrols in Burma's Karen state. 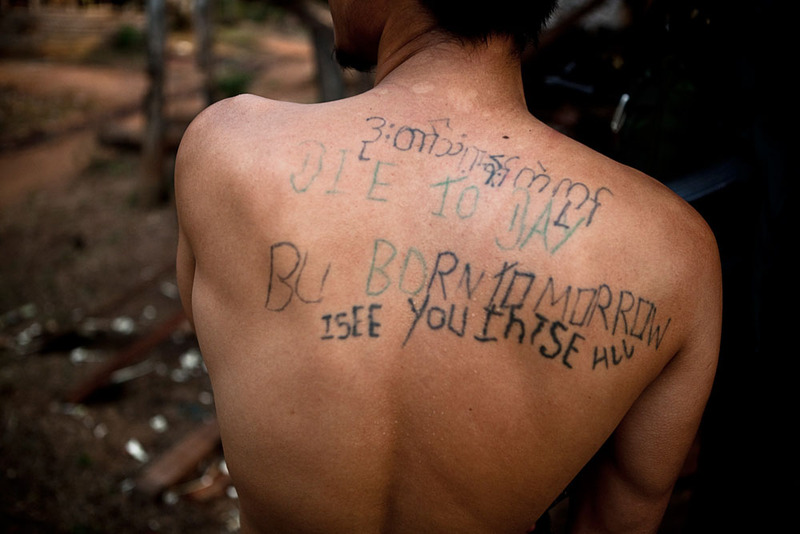 tattooed soldier of the KNLA guerrilla unit in Burma's Karen state. 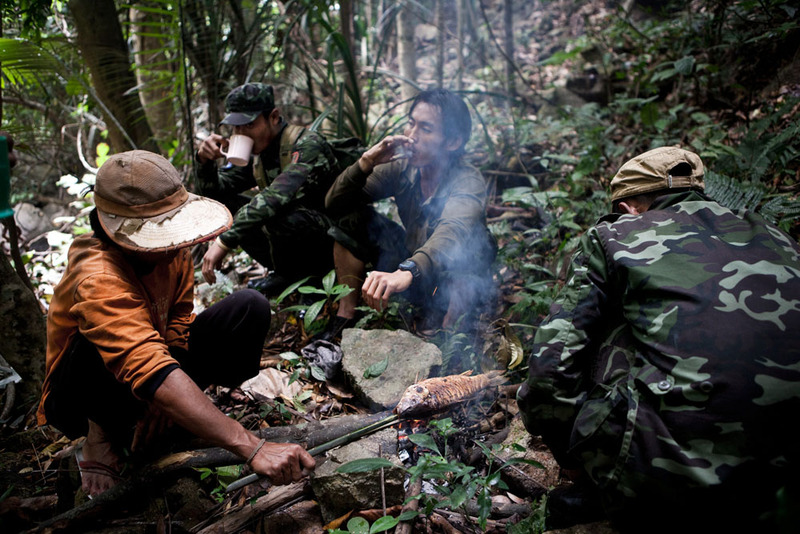 Soldiers of the KNLA guerrilla unit are resting after a long walk in Burma's Karen state. 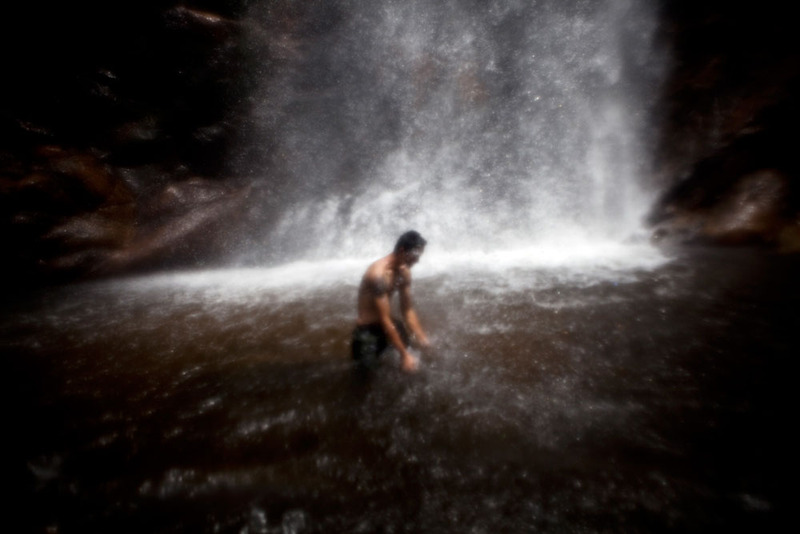 A soldier of the KNLA guerrilla unit takes a bath under a waterfall in Burma’s Karen state. At the "Mae Tao" refugee clinic in Mae Sot. The clinic provides health care for burmese refugees and migrants. Most of the treatments are free of charge. 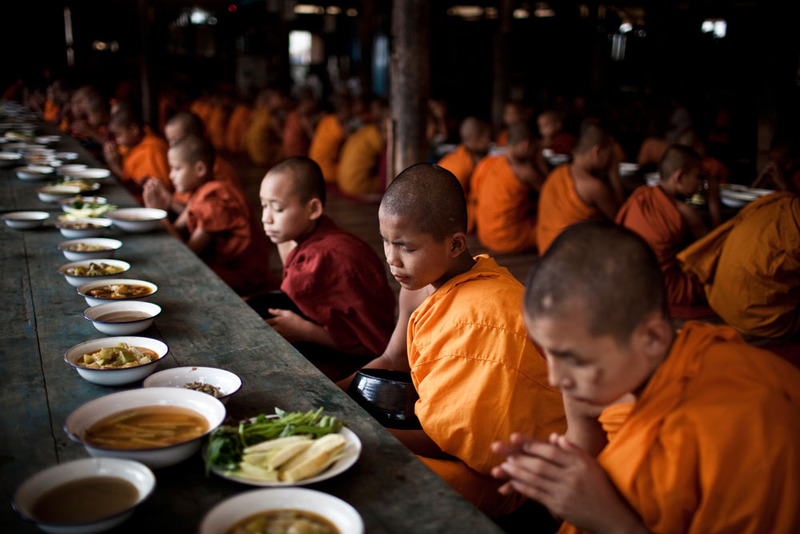 A buddhist monk school at the refugee camp of "Mae La" in northern Thailand, close to the boarder to Burma. Thousands of Burmese refugees live in 11 camps along the border. Most of them belong to the ethnic group of the "Karen". 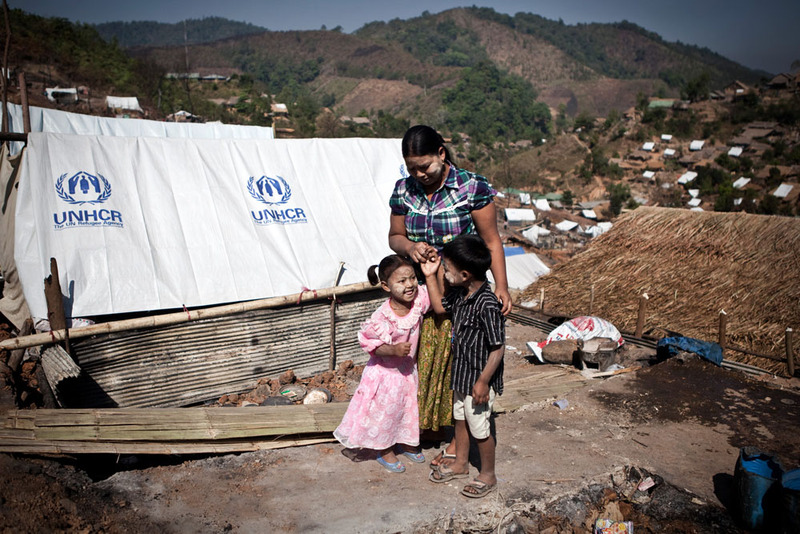 Mae la shelters more than 60-thousand refugees and is the biggest camp in Thailand. A soldier of the KNLA (Karen national liberation Army) guerrilla unit on a patrol in Burma's Karen state. A soldier of the KNLA guerrilla unit controls a scar that he received from stepping on a landmine. 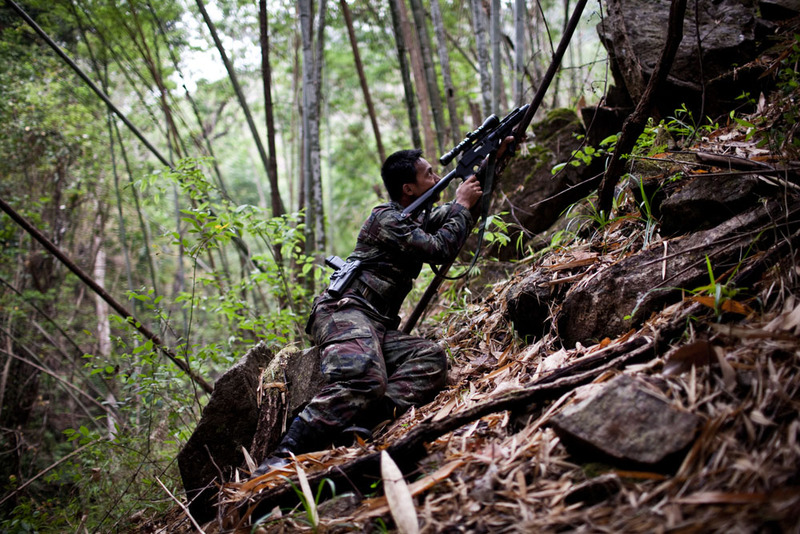 A soldier of the Kachin rebels patrols in Burma's Karen state. 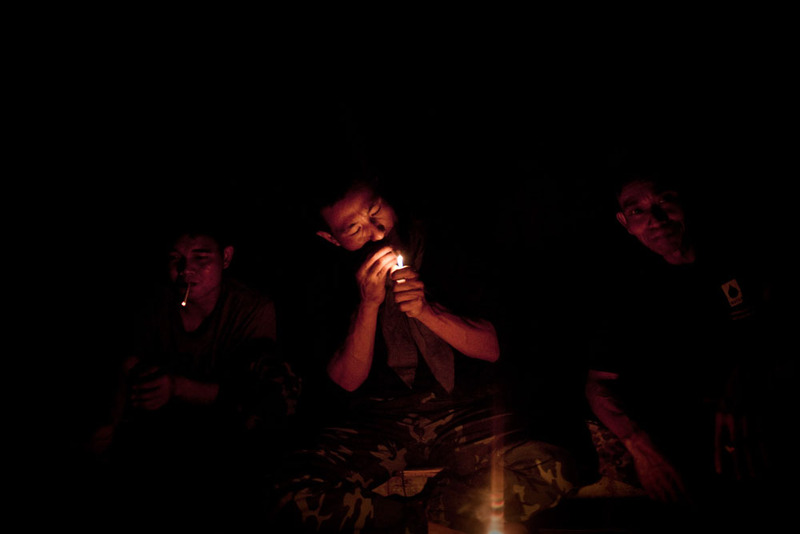 A soldier of the KNLA guerrilla unit lights a cigarette at nighttime in a small village where they stayed for the night. 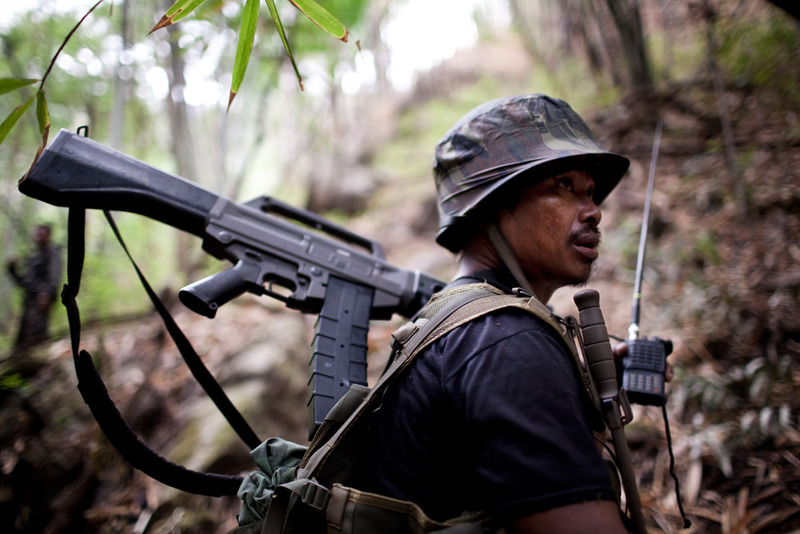 A soldier of the KNLA is seen carrying an Assault rifle. Because the rebels have very few vehicles they have to march a lot. At a christian mass in Burma's Karen state. Most of the Karen are christians. At the refugee camp of "Umpiem Mai" in northern Thailand, close to the boarder of Burma. On the 23rd of February 2012 a huge fire destroyed around one third of the camp. The fire, which was caused by a cooking–accident burned more than 1000 houses. Thousands of Burmese refugees live in 11 camps along the boarder. Most of them belong to the ethnic group of the Karen. 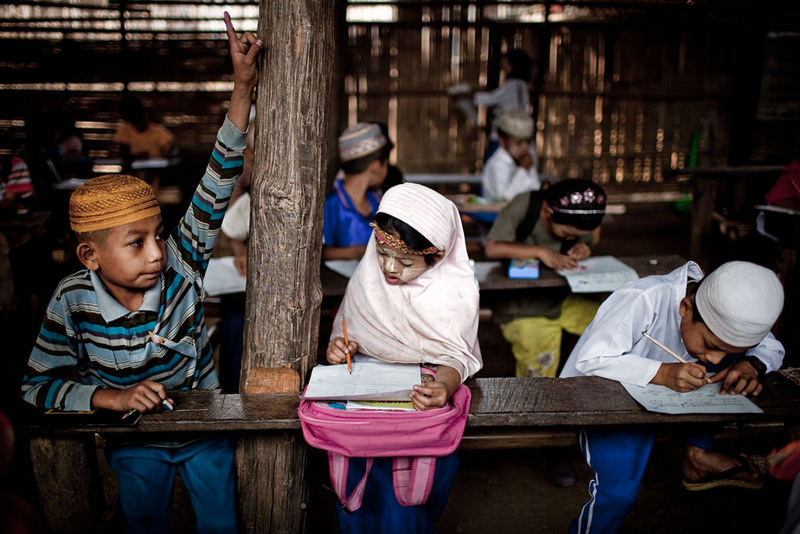 A muslim school at the refugee camp of "Mae La" in northern Thailand, close to the boarder of Burma. At the local landfill in Mae Sot. 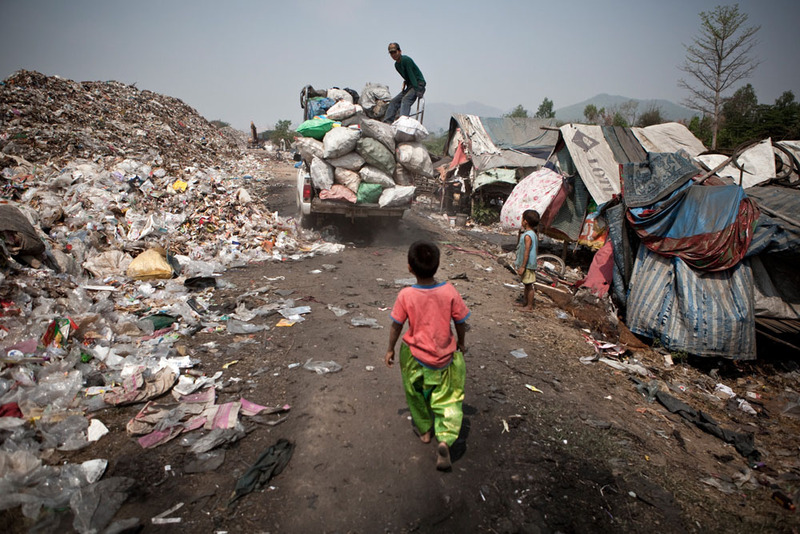 Around 60 family’s live and work at the dump site. Most of them are illegal Karen refugees from Burma. As they don't hold passports and are not recognised as official refugees, they risk being arrested or deported back to Burma. 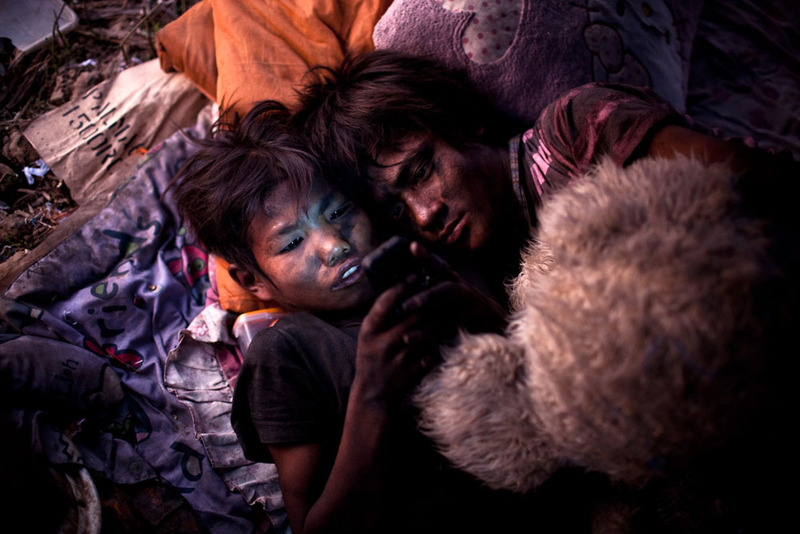 Two Karen kids are playing with a mobile phone that they found at the local landfill in Mae Sot. 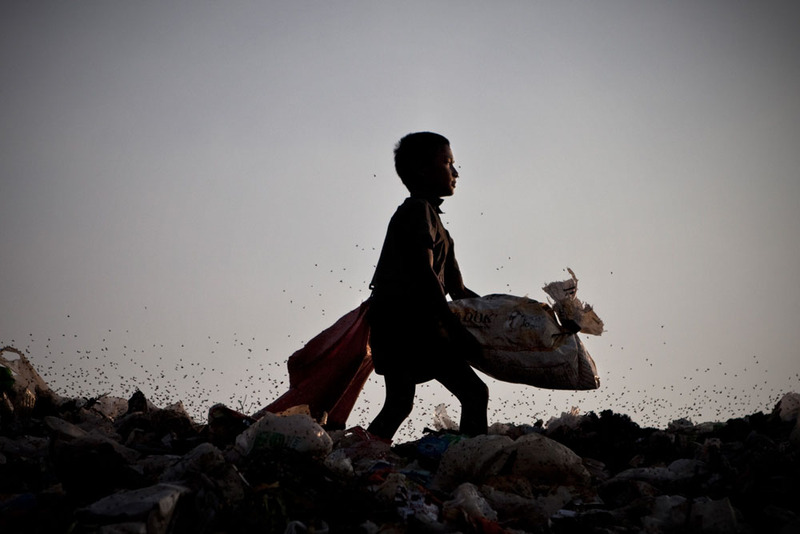 A young Karen-refugee is surrounded by flies at the local landfill in Mae Sot. At the refugee camp of "Umpiem Mai" in northern Thailand, close to the Burmese border. On the 23rd of February 2012 a huge fire destroyed around one third of the camp. 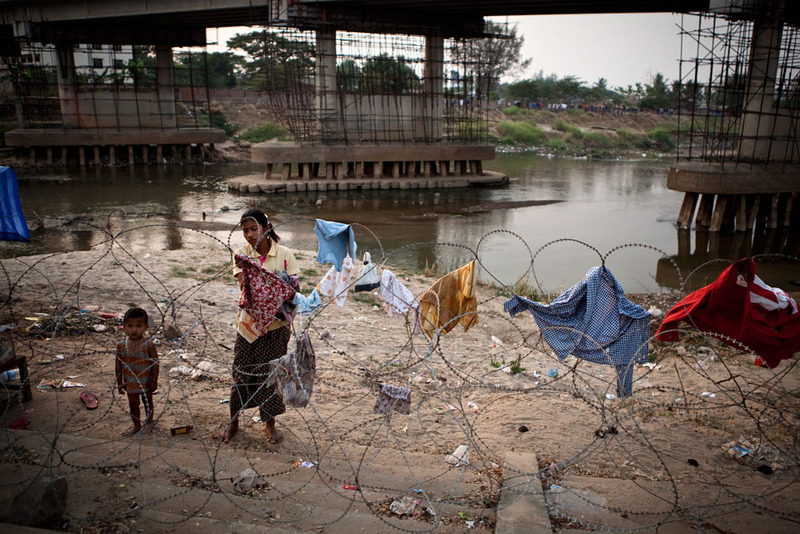 A woman dries her laundry on barbed wire at the border crossing of Burma. In this Area the Moei river serves as a natural boarder. Next to the official border, hundreds of people cross the river daily. Burma’s military regime is loosening its grip, after more than 40 years of repression. Political prisoners are being released, sanctions have been lifted and the regime is opening towards tourism and foreign media. But as the country reforms, there are still numerous internal conflicts. Through the transformation from a military junta into a more-or-less democratic government, there were in fact even numerous new problems created. My project is a illustration of the places where these problems are still prevalent. In the last two years, I have visited the old conflicts - the places where there is fighting and people have been dying for many decades. On the other hand I'm looking at the new issues and problems that the country is facing. My first trip took place at beginning of 2012. I visited the boarder region of Thailand and Burma. 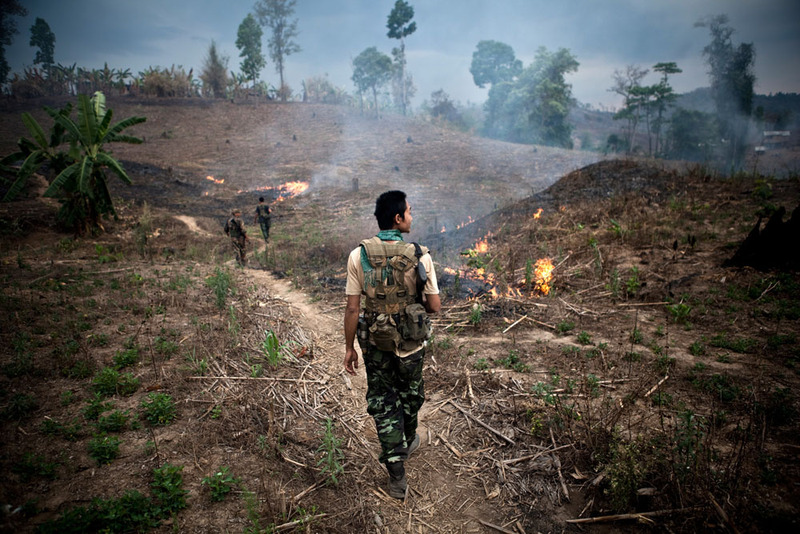 On the Burmese side of the boarder one of the world’s longest ongoing civil wars is taking place. 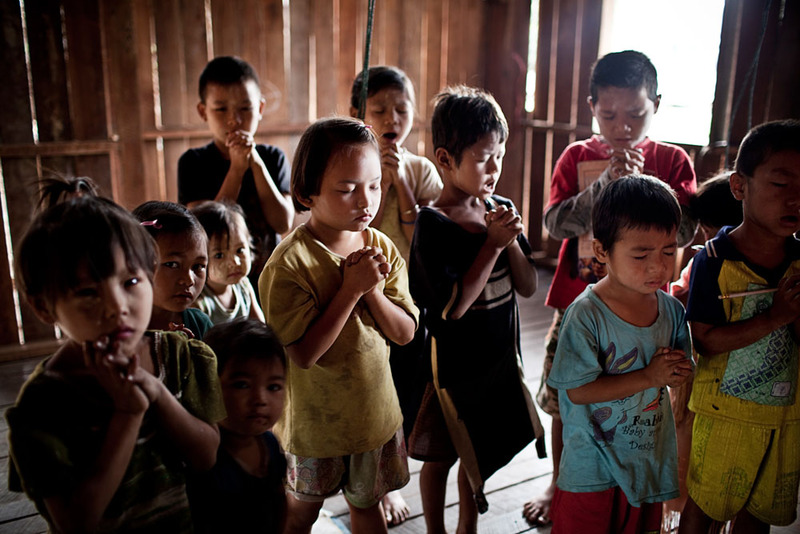 Since 1948 the Burmese military has been repressing the ethnic minority of the Kayin or Karen people. Hundreds of thousands are living in refugee camps along the Thai side of the boarder. For them, a return home is not in sight, even though there was a ceasefire agreement signed in January 2012. It’s a fragile peace in Kayin State. The Burmese Army is currently upgrading all its army-camps, to modern concrete facilities, the Karen National Liberation Army (K.N.L.A) stays highly alert. My second trip took place in February 2013. This time I went to Kachin State in the far north of the country. I visited the unofficial capital of the Kachin people – Laiza. The conflict is the last one where there is still active fighting going on between the Burmese Army and the K.I.A, the Kachin Independence Army. The conflict originally started in 1961, but there was a ceasefire agreement set in place in 1994. 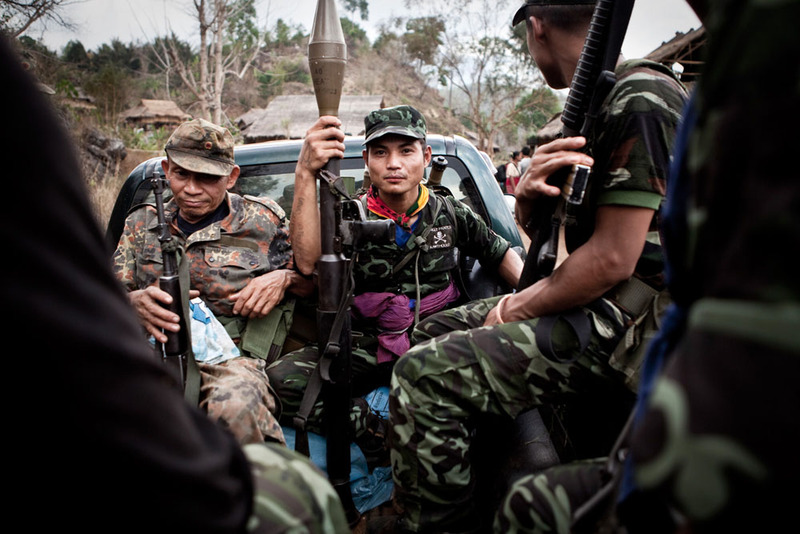 After the resignation of the military-junta, the 17 year long ceasefire fell apart in 2011. New fighting erupted and is still going on to this day. So far, thousands of people have been killed. Laiza is under siege by the burmese Army and was heavily air-striked at the beginning of 2013. Despite numerous peace-talks the fighting is ongoing and has left behind more than 100 000 Kachin refugees. The third trip took me to the west of the country, where with the change of government a religious conflict flared up. 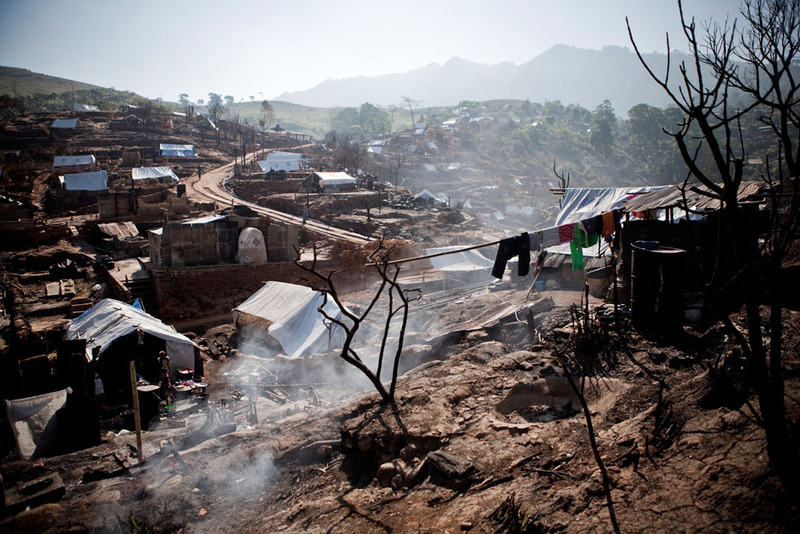 In June 2012 violence broke out in Burma’s second poorest province - Rakhine State. In the regional capital Sittwe, buddhist Rhakines clashed with muslim Rohingyas. The riots that broke out lasted for over a week, resulting in many deaths and thousands displaced persons. A second wave of violence broke out at the end of October 2012 in the same region. The clashes quickly spread throughout the country and resulted in the deaths of around 650 Rohingyas, over 7000 homes have been burned to the ground and more than 100 000 people have been displaced.